A few further details on my blog; specifically, this post. 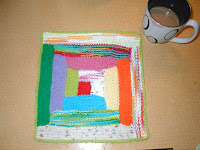 Another Mason-Dixon knitter (not on this along) commented on one of my personal blog posts. It turns out that she has a beautiful log cabin on her blog, and she details a way of binding off and picking up that doesn't create seams on the back. Right now I am crazy-go-nuts crocheting on a ripple afghan. I may get back to another log cabin when I finish. I love this pattern and it is so easy to memorize. 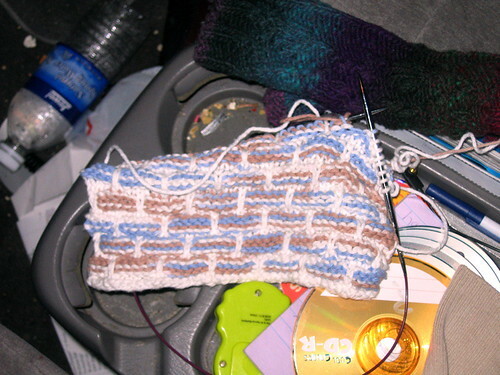 It has become my car knitting for traffic lights and waiting to pick up my kids. Here is the latest, pic taken in progress before I had my car thoroughly cleaned. I just finished it on Wednesday and Smokey modeled it for me. This is my first post on the new blogger since I moved my blog to typepad. I am still planning to knit a curtain using the MD scribbles principle however other things just get in the way. 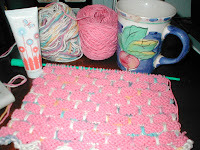 My mom wants white dishcloths for Mother's Day so I have already started. I am going to be on top of things this time. 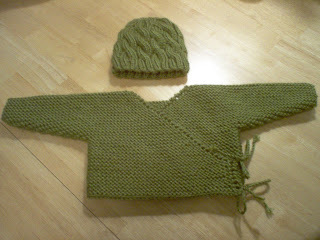 I have toyed with the idea of knitting the bobbled warshrag since I first read the MD book. It looked terribly complicated, which both intrigued and scared me. I've never done bobbles, but I do like to try new things. It might have gone smoother if I had read the pattern right the first time. It would have certainly gone smoother if I hadn't twisted the stitches when I joined the circle. But it's done and it mostly looks like it should. My eyelits came out a little wonky - any thoughts on that? Despite my technical difficulties, I really like this pattern. I will try it again. I can see it also being a good inspiration - a dolly skirt? the edge of a scarf? This one will be gifted to my mom, who will like it wonky eyelits and all. I had some leftover yarn from working on my never ending mitered squares and whipped up a few wash cloths in the baby genius pattern. I gifted the blue one to my grandma and she's doing the trial run. It's just a little leftover PnC. I couldn't get over how little yarn it took, a lot less than the ballband. Pictures on my blog (scroll to the bottom). I have just finished my first kimono and hat set for a baby shower gift, and have another one to make before this Friday! There is a double baby shower at work. I have been lurking here for a while, and just thought I would share! Hi all. I have a question for those who have made the tailgate rag rug. This is going to sound silly but where does one get the rag balls? I was going to buy fabric and cut them but I though there must be an easier way (or at least I hope there is). Thanks for your help. To make a wall hanging I used a few techniques from the book. I used a spare centre from an afghan that I had made, used the log cabin technique to edge the sections in red then used the flying geese method to make blue and white triangles around the lot. 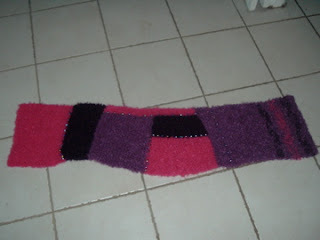 Add a length of beaded trim , some ribbon and an old wooden knitting needle spray painted red and we have a wall hanging! I'm well chuffed at this knitting pattern bodge! This is my first attempt at log cabin. Did I do something wrong here? I remembered to bind of on the right side but I don't think that I should be seeing any "Vs". Isn't this cute? My mother just finished it. She made a petal dishcloth and inside as you can see is the mason dixon warshrag. Tieing it all together is a cute little quick crochet chain to create her flower. My best friend from high school is about to have her second baby boy, so I whipped up a couple of Bibs o' Love and a Baby Genius Burp Cloth. I found the dark blue Rowan Handknit Cotton and the lighter Debbie Bliss Cotton Denim Aran in the stash, and they were just right! I just love the Mason-Dixon "baby bib of love" pattern! 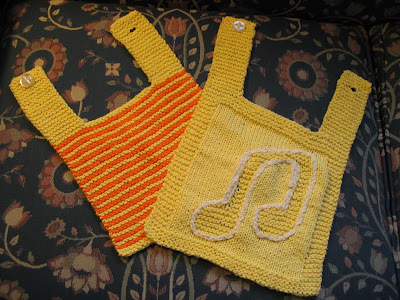 This time I made one striped and the other I used a music note dishcloth pattern with the Mason-Dixon straps, outlining the notes with cotton chenille so they stand out better. Now that this has been sent to the proper babe, i can reveal it to ya'll. Log Cabin (guidelines from Mason Dixon book, duh!) 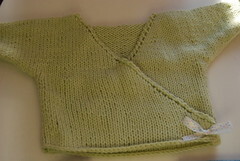 cotton blanket for a Boy. I was so inspired by the Argosy blanket that I made this scarf. It is a laceweight kid mohair-silk blend whose name I don't remember right now, and I had to change the pattern a little to make the stripes work. I love the final product, but now it's getting too warm (in North Florida) to wear it. Here is another Kimono for my grandbaby, Bella. I used Knitpicks Shine in Wisteria. The little mousey buttons are from Joann Fabrics. I really like the Shine and will use that on anymore Kimonos I make. She is no longer a newborn, so I increased the back, front and sleeves by one inch. I also CO ten extra stitches. 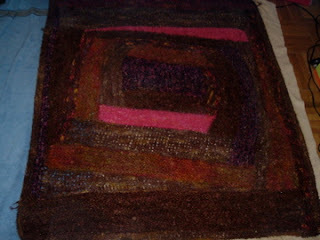 here is a scarf I based on the Moderne blanket - the left hand side in the photo. The warp has happened because I used the same size needles to bind off as to knit with - on purpose. 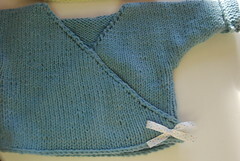 for my friend who is having twins soon, i made two stockinette versions of the kimono. i used less than a skein of TLC Cara Mia for each one. i used iron on velcro "dots" instead of ties as fasteners and sewed the little bows for show. that iron on velcro is awesome. Cute baby girl baby bib DONE!! 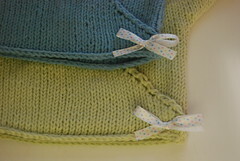 i love these....they are such quick knits and i hear - very functional! this one is for a friend from college who just had her first baby about 2 weeks ago. it was a girl! thank goodness! so many boys lately! This is Suar n'Cream in Pretty Pastels. i found it at Hobby Lobby during one of their 99 cent sales! i get in so much trouble during those sales! Okay. I just got back from Joanne's and saw that they have a Lion Brand 1lb Cotton Cone. It's a 4 ply worsted weight yarn. Do you think you can use 3 strands of this to make the bathmat? The pattern calls for the Peaches & Creme double worsted which I researched and found that it is 8 ply. Has anyone used this Lion Brand Cotton Cone before ??? Log Cabin Dishcloth Off My Needles And Out Of My System! I know such knitting peace now that I was able to knit a Log cabin Dishcloth! I tried to keep my warm and cool colors on opposite sides. 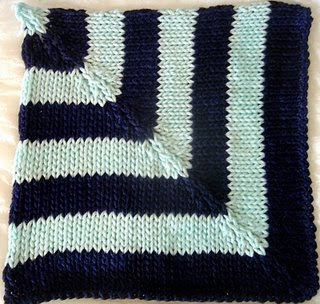 What immense pleasure to knit something practical with scraps of leftover Sugar & Cream Cotton! Still....it's not completely out of my system yet as I have a Baby Log Cabin blanket in the works that is a charity project. It's constructed by yarns donated by Parishioners from my church. It's a nice little knitting project, well, for now at least! 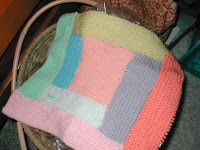 Log Cabin knitting just may be the next best thing since the Ballband Dish Cloth! Or, maybe not!I am still smitten with my beloved Ball Band Dish Cloth. I call this "Welcome Spring"! My 1st warshrag! I used Lion Brand Cotton Ease in Terracotta, Maize and Almond. A woman at my church is kind enough to do the preacher's families laundry. I am the preachers daughter. I love Mrs.J! She is awesome. 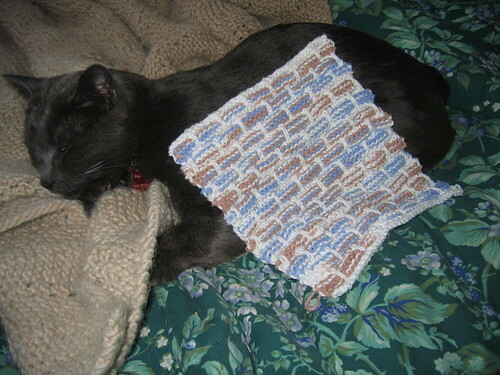 A few months ago she was washing the large supply of dishcloths I have knit myself. On my birthday, I gifted myself a tiny ballband (33 stitches, 6 bands on size eights). She found it and left me a note saying how much she loved it, and would I please please knit her some. I said sure. She had said she would pay me, but I was like, You do my laundry weekly. You are not paying me. I, being the forgetful teenager I am, forgot about them. Two weeks ago on some Sunday, she asked me where her dishcloths were. I was like, They are in the works. Over three days, I knit up four little dishcloths. She loved them! Not only did I gift a wonderful person, I used up two skeins of yarn that I hated. The colors are like the conversation hearts that you eat on Valentine's Day. I don't like them, but they were gifted to me. I used them up! Hi all: had a LOT of fun knitting this one! (and it was a huge stashbuster as well - my way of getting rid of an afghan kit). Finished size = 42" x 52"